In the night of Tuesday, September 9, the inhabitants of the earth will be able to enjoy the latest in this year superluniem. This colorful astronomical phenomenon occurs when the full moon and new moon with the moment of closest approach of the Moon and Earth. Night light visually seem larger and brighter than usual. When the moon is at perigee, the nearest to the earth point of the orbit of the satellite, it looks like 14 percent larger and 30 percent brighter than the passage of the farthest point – apogee. 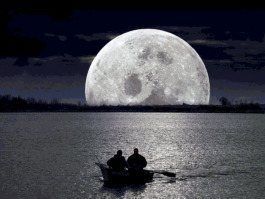 At perigee, the moon is to the Earth by about 50,000 miles closer than when it passes apogee. The coming full moon will be the last before the day of the autumnal equinox, marking the onset of astronomical autumn in the Northern Hemisphere for the residents. Distance to the moon will be 359,100 kilometers, according Vesti.ru. Usually superlunie can be observed twice a year, but the year 2014 was rich in these phenomena: this is the fifth in a row event of its kind. The inhabitants of Moscow there are many chances to see the upcoming superlunie. Forecasters promised that the weather will clear and allow to fully enjoy the spectacle.